This is kind of a lazy day recipe. Well, meant to spice up a lazy day recipe. We've all got those, "ugh, what the heck am I going to make" dinners. For me it usually ends up as burgers with bacon and sweet potato fries. Now, I know that's nothing to gripe about, but sometimes I just need something a little different. I thought making a chimichurri sauce would be fun, and heck, instead of burgers, how about lettuce wraps? 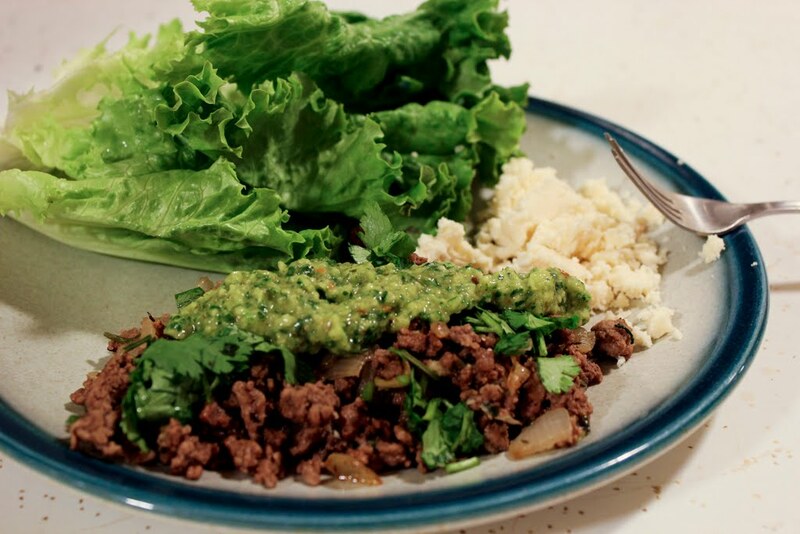 I love lettuce wraps. There are a million and one recipes for chimichurri, and I'm by no means attached to one. But basically, it's just parsley, garlic, oil, and vinegar. You can take it from there. I added in onion this time (a bit too much actually), and red pepper flakes are a must. Paprika is a great spice to add and you can also add in cilantro, but be aware that some people find this blasphemous, as it's not traditional. Pff, whatever. Try experimenting with the level of vinegar. 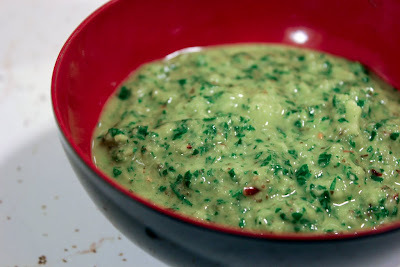 That's certainly the most overpowering aspect of chimichurri. I start on the low side and add little bits at a time until it's the right strength. The beef here is simply seasoned and you can play around with what spices and aromatics you use. 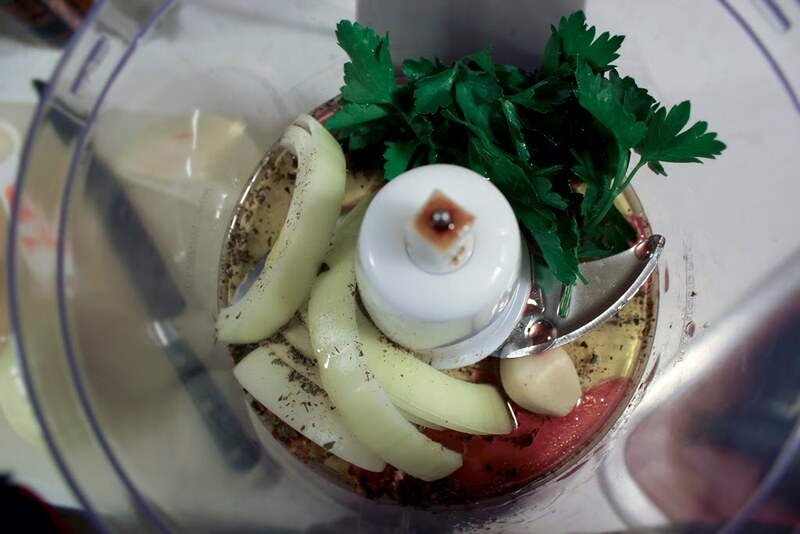 I used cilantro, onion, garlic, cumin, oregano, and thyme. 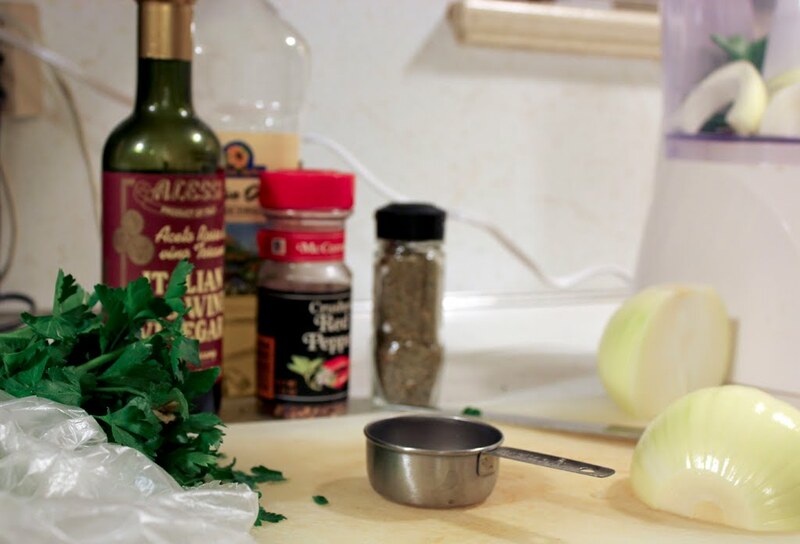 Try serving this simple dish with different kinds of veggies to mix it up. A zucchini and garlic sauté would work great. I made sweet potato fries, big surprise. Plantains would be wonderful, and fried yuca too! Mushrooms, peppers, and ooh corn on the cob in the summer! The list goes on. I'd keep the vegetable flavorings on the light side - some garlic, salt, and pepper, and perhaps some lemon or lime juice. 1. In a food processor, combine all ingredients for chimichurri and blend until smooth. Alternatively, you can hand chop everything and have it be on the chunkier side. 2. In a medium sized sauté pan, heat oil. Add onions and cook until softened, about 5 minutes. 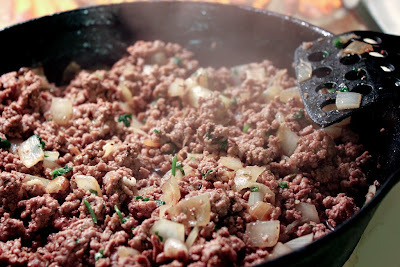 Add remainder of ingredients and cook, stirring often until beef is cooked through, about 10 minutes. 3. Assemble the lettuce wraps how you'd like. 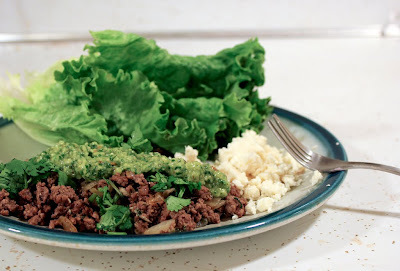 Top the beef with chimichurri, as well as cheese, extra cilantro, sour cream, salsa, and any other extras you'd like. I have to push for using cotija again - it's such a good cheese! Originally posted at my blog, the crankin' kitchen!